Are you in the midst of hunting for a new job? If you’ve already gone to a few interviews, then you know that many potential employers ask the same interview questions over and over again. Oddly, many people still show up unprepared with good answers to these common interview questions. If you get smart and come up with a good answers in advance, then you’re going to be one step ahead of the people you’re competing with at the job interview. Here are the 30 most common interview questions and how to answer them. We have partnered up with TheInterviewGuide.net for a great deal! 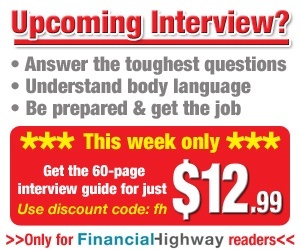 You can now get the ultimate Interview Guide for $12.99 ONLY THIS WEEK! This guide covers much more than just interview questions, it is over 60 pages long and a MUST have if you are in the job market. Upon check out just enter code fh and you’ll see your discount. Good luck! Great resource here. When I was in the private sector I sure did see a lot of these questions. The public service is a different beast however as there is a lot of HR over sight, competency based questions and essentially a point based system: know the keywords, use them well, win the job. @Sustainable PF … Thanks so much for pointing out the difference between the public and private sector. You make a great point! I’ve been reading “Sway” by Ori Brafman and it proposed the idea that competency questions and reviews of past experience make a lot more sense in hiring than the traditional interview does even though it’s still what many employers are using. Actually I’ve heard from many sources that the question of starting/ending rate of pay should be handled more like the one about expected compensation. Namely that your pay at your other jobs is really not material to the current job situation. Any mention of numbers always puts you at a disadvantage in the negotiation of salary. For example, say you made 50k in your last job, but were underpaid because of some other intangible benefits. The pay range of the job your are interviewing for is roughly 70-80k and you are completely qualified for it. Saying you made 50 at your last job is only going to give them ammo to pay you less than you deserve. HR gets these questions from experts in the industry. They jot them down on paper or memorize some of them and ask candidates questions. I bet HR rep is not even interested in hearing the answers. These questions are asked by HR not by department managers. We all know HR is the biggest firewall of any kind on the face of the earth especially in the U.S. They can reject you because you part your hair on the right instead of left. “I’d rather be respected (than liked or feared)” … that’s a great answer to that question. I once got the question “Is it better to be kind or fair?” The correct answer is fair. If you’re loved for your kindness, and the day comes when you have to assert your boundaries, then you’ve lost the only thing for which you’re loved. If you’re loved for your fairness, you can carry that quality with you into any situation. Please tell us what values you will be adding to our company. what are other question we can ask at the end of the interview? At some point, whether you like it or not, you’re going to have to discuss compensation. I don’t see the point in totally side stepping the question as suggested above. In fact, I think that if you phrased it exactly as above, I might even find it a little rude. Look at this as a mark of interest from the interviewer and an opportunity to begin negotiations. Companies have a budget and a cap for the positions that they are hiring for. Likewise, job seekers have expectations and bills to pay. If the company’s pay range tops out at 40k, and you are looking for a minimum of 55k, wouldn’t you rather know early on rather than after you’ve spent hours on interviews and skills tests (possibly taking time off from a current position)?